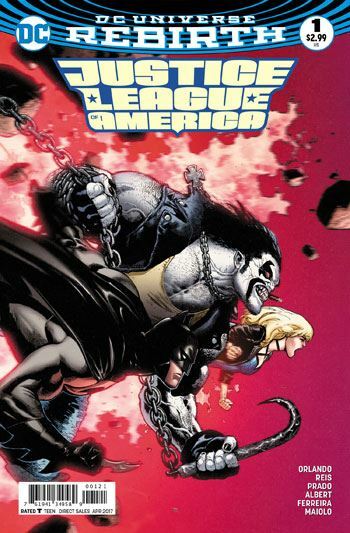 Justice League of America starts off with a bang as the regular series begins with this issue. While the Rebirth one shot served as an excellent introduction to the various heroes that Batman has recruited for the team, the Atom, Black Canary, Killer Frost, Lobo, the Ray and Vixen, this issue explores these characters as well, though more briefly. Instead, the bulk of this first issue is spent on the villains. Not a bad decision at all. Orlando brings back the Extremists, a group of villains introduced a couple of decades ago in Justice League Europe, who have appeared a few times over the years. These Extremists are not exactly the same group that we have seen before. It’s their first time meeting the League. But they are largely the same. They come from a place called Angor, a world that they destroyed while fighting to conquer. Essentially, Angor represents the Marvel universe, and the Extremists all correlate to villains from that company. Their leader, Lord Havok, is based on Dr. Doom. Gorgon is Dr. Octopus, Dr. Die-Hard is Magneto, and so on. This issue sort of introduces a couple of new members for that team, although we don’t learn much about them as yet. The art on the story is really impressive, some of it looking so wonderfully three dimensional. Reis is great at choosing the angles for the scenes, making the threat of the Extremists as intense as it needs to be. Although this is only a lead in to the story, there are some wonderful moments along the way. The Ray’s eagerness to be helpful when getting people to safety, Lobo fighting the trolls to keep the dolphins safe, and the Atom and Killer Frost getting all science geek together. Orlando brings the issue to a strong finish, a great teaser than guarantees the reader will have to pick up the following issue. 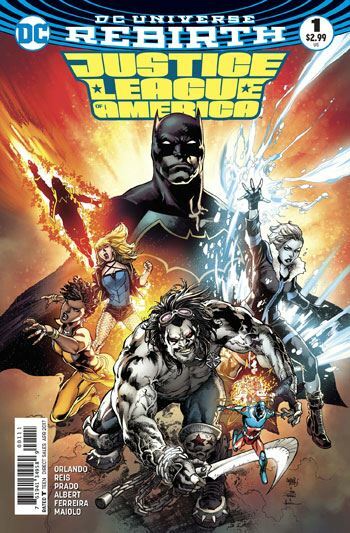 With only one regular issue and the Rebirth special under its belt, Justice League of America has already blown the other Justice League book out of the water.